Rangers manager defends winger ahead of disciplinary hearing later on Thursday. Rangers manger Steven Gerrard has denied Ryan Kent's clash with Scott Brown was violent. Kent lashed out at the Celtic captain during Sunday's Old Firm match and faces a disciplinary hearing later on Thursday. Gerrard said he didn't believe the winger struck Brown in the face and said the pictures made it look worse than it was. The Ibrox boss was speaking before he was given a one-match ban, understood to be for comments made to referee Bobby Madden after Sunday's 2-1 defeat. Gerrard said: "We don't think it was violent conduct and we don't think it was in the face, simple as that. "I have known Ryan since he was eight, nine years of age, he hasn't got a violent bone in his body. He has never been involved in something like this before. "I think Ryan was merely pushing him away to get him out of his face after being provoked. That's our side of it." 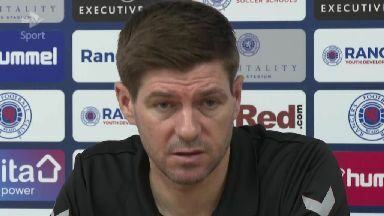 Celtic, Rangers, Gerrard and Brown all learned on Thursday morning that they were facing SFA charges over ugly scenes on Sunday.